A team led by MPs Therese Coffey and Simon Hoare quizzed their way to victory in the inaugural All Party Parliamentary Beer Group and PubAid Pub Quiz, held yesterday (5 February). 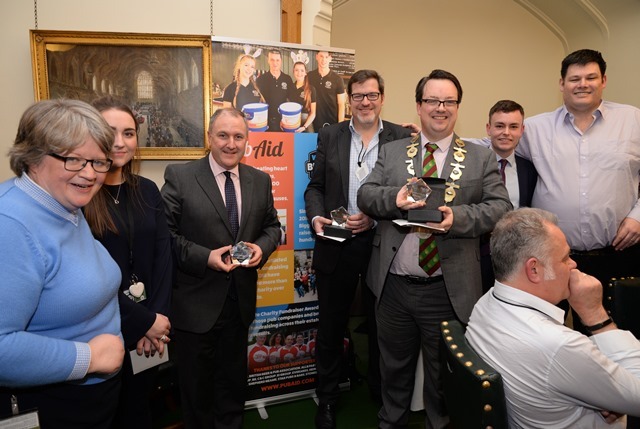 Team ‘Bling’ lifted the winners’ trophy ahead of fierce competition in a packed room in the House of Commons with 20 MPs taking part as well as other parliamentary colleagues, brewers, pub companies and journalists. With Mark Labbett – aka The Beast as seen on The Chase – as quizmaster, the 100+ contestants worked in teams to answer questions on everything from sport and science to music and movies – as well as a beer round. The quiz was held just a month ahead of the World’s Biggest Pub Quiz, organised by PubAid with Prostate Cancer UK. More than 1,200 pubs have already signed up to run the quiz between 3-7 March and PubAid hope that the final number will at least match last year’s, when 1,500 pubs took part, raising £190,000 for hundreds of charities. MPs who took part in the Parliamentary Pub Quiz are being encouraged to also attend a World’s Biggest Pub Quiz in a pub in their constituency. The World’s Biggest Pub Quiz is completely free of charge to pubs, who receive two sets of questions, posters and social media assets to encourage customers to take part. Pubs can register now at www.worldsbiggestquiz.pubaid.com. Although the quiz is scheduled for 3-7 March, pubs who want to take part but can’t run the quiz during that week are welcome to run it at any other time in 2019. Pubs are encouraged to support official partner Prostate Cancer UK, but are also free to support another charity of their choice.